The saying "better late than never" fits like a glove to Kickstarter authentic as it was almost unforgivable in full 2013 did not count on an official application from which you access the platform in a much more comfortable and intuitive than Safari . And now already among us. The application allows us to do everything we can do on the website Kickstarter, which of course is to see projects, participate in them with our money and the latest news from projects to which we subscribe for participating. From Kickstarter say they've caught all the experience gathered in the past three years and have put all in the application, trying to make it as easy as possible to use, allowing get to participate in a project in a few minutes thanks to the fast interface designed and which retains the features of the desktop website. If you are an active user of Kickstarter as I am, the app will become a blessing. It's time to forget the email to receive notifications, as the app will send them to us via Push instantly and wherever we can review them. Also find projects is easier than ever thanks to the integration with the iPhone's GPS and therefore accurate positioning in a few seconds. For the creators of projects is also interesting because it has a specific section where you can see the evolution of your project, new messages received and even have the ability to send a status update without having to turn the computer for it, a very good idea to have updated the followers of the same whatever the situation. We can not forget that Kickstarter is a growing platform with a spectacular numbers: more than two million people put their money in a project last year, 177 countries had different active users and managed to move an amount exceeding $ 300 million , making them the leading website crowdfunding is becoming both fashionable and it allows anyone with a good idea to bring up a product. 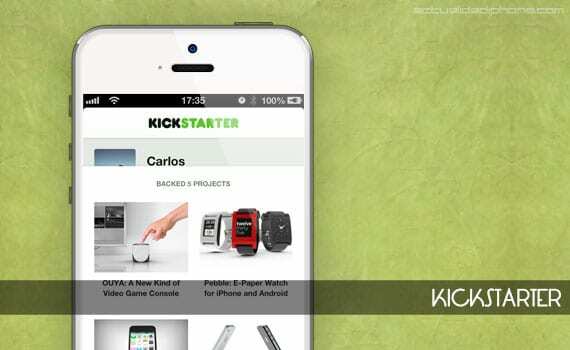 Article Kickstarter launches its official iPhone application was originally published in News iPhone .